For those of you who are new to the concept of Tarot deck interviews, let me offer this brief explanation: Each deck, being a work of art as well as a labour of love, has been infused with the spirit essences of the Muses who inspired this deck. These essences gave birth to a new entity: the Guardian Spirit of the Deck. In a deck interview, I give this Guardian a voice. I must admit that when I first looked at sample images of the Tarot of the Hidden Realm, I wondered if it would be readable at all. Most of the deck images were just close-ups of people’s faces. This is definitely NOT a Rider Waite clone! When the deck arrived, I eagerly unwrapped it and started looking through the images. They were so pretty! I crossed my toes and fingers, held my breath and laid the cards out for my first ever reading… Phew! They read like a dream! I have really been looking forward to learning more from the Guardian of this deck herself, so let’s not delay the interview further! THR: Fair, sociable and charming. Sorry for the latter – it sounds like I’m blowing my own horn but it’s good do know one’s strengths… yes? Me: Certainly! And I’m sure you’ve been told how charming you are plenty of times! Me: And see things in a new light? THR: Or a new dark. Upside down even. *giggles* I’ve been told those thoughts often lead to a greater ability to stick to one’s guns because it becomes easier to accept a new or unconventional approach, which is often necessary when it comes to problem resolution. And, correct me if I’m wrong, but problem resolution is what people seek from the Tarot, yes? Me: I’m just fascinated to see the Heron here… One of my main Spirit animals and certainly a source of personal courage to me. I always get a feeling that it’s OK to be a bit weird when I see a Heron. Or eccentric, as the British like to call it. THR: The ability to create a lasting legacy by encouraging you to use your imagination. That novel you always wanted to write… Use these cards for brain storming! Me: I certainly will… Thank you! THR: To not shy away from pain and heart-ache but to face it head on. Learn to love the thorns as well as the roses. THR: By helping you release any limiting thoughts and beliefs so that you can begin living the life of creative bliss and sexual ecstasy you always longed for. Owning and embracing your shadows, you can finally move forward in a way that inspires and liberates others. Me: This doesn’t have anything to do with that dream I had the other week, does it? THR: You know it does! THR: I will never cease to inspire you or ignite the flame of creativity. You can count on me like a box of safety matches! Me: Thank you, Tarot of the Hidden Realm. This has been a most enlightening interview. I shall look forward to working with you and I’d like to add that the client readings I’ve done already under your guardianship have been very insightful! PS. This deck comes as a kit with a companion book by Barbara Moore. I have not yet had a chance to dive into the book but the snippets I’ve read so far look promising. There are a few spreads included as well, which I will have to try out. 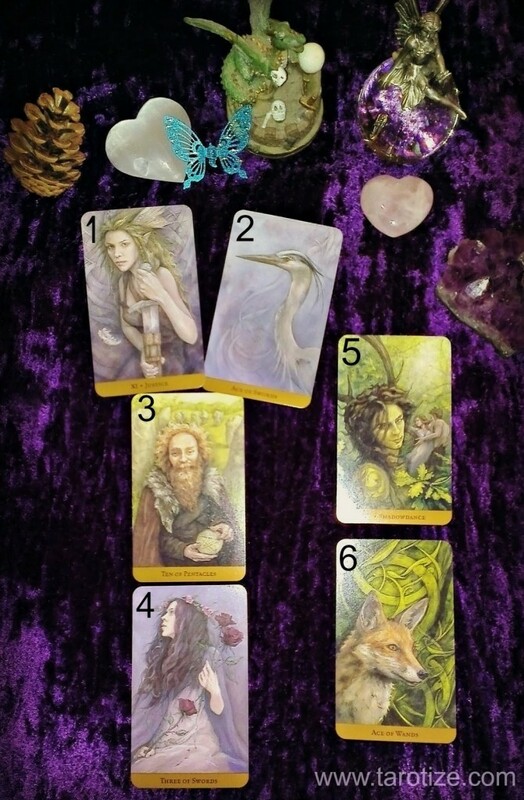 Two of them are about ‘What is hidden’ – apt as this deck is about the hidden realm of the Fae!